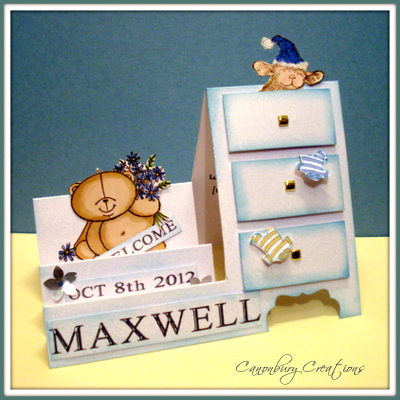 I love these side stepper cards looking like chest of drawers so this is what I made for Maxwell. Love the set of drawers you made, its a fantastic new baby card. loved the French card in the previous post as well. Those drawers are such a sweet idea and the teddy holding the bunch of flowers. What a beautiful way to welcome a baby. Such exciting news for you. How cute! Such a lovely card! Great card Val - these "drawer" side stepper make impressive cards. This is great for a little boy - I'm sure they'll love it. Wow, wow, wow, Val! This is totally stunning and I love the chest of drawers idea! I may have to borrow that idea as I have a baby girl card to make and I have no inspiration at present! well this card is just about the cutest thing that i have ever seen, val!! your goddaughter is going to treasure this card!! This is the sweetest card for a little boy. A great shaped card, love how those little images stick out of the drawers! I've had a look through some of your other work - you do really pretty cards, in different styles too, so I'm your newest follower! Looking forward to see more of your work! Have a nice week end! OOOOOOOOOOOh AMAZING, GORGEOUS AND FANTASTIC CARD!!!! !i love it Valerie just a perfect card for a baby, great work!i love all your details, the clothes out the drawers, the cuddly toy, fantastic sponging on the edges...simply GREAT! Oh my this is what I call a baby card!!!!! How adorable and so so gorgeous!!!!! Stunning coloring and design!!!!! Way to go Valerie!!!!!! This is so beautiful and pretty and cute and everything ! I love your creativity such a perfect card and a beautiful remembrance.